Data collected by The Center for Information and Research on Civic Learning and Engagement indicates the number of millennial voters during the 2008 presidential election nearly matched their baby boomer grandparents. Millennial and Boomer turn out for President Obama’s first campaign was 51 percent and 69 percent respectively. Boomers are well-known for their commitment to civic engagement and millennials are the generation that grew up voting for their favorite idol. President Obama’s 2008 campaign should have served as a wake-up call to Generation X. Millennials outnumber us and, unlike us, they are willing to vote for what they want. What might millennials want a governance model to look like? This group can be contradictory so it should not be surprising their concepts of governance might be as well. Also known as the “me” generation, they are highly sensitive to issues of fairness, inclusiveness and social equity. Contrary to their heightened sensitivity, rules are of little value to them. Breaking rules that infringe on their wants is looked upon favorably and yet they do not hesitate to issue swift and decisive punishment when they feel it is warranted. The results of a recent Harvard poll perfectly illustrates the duality of this generation. 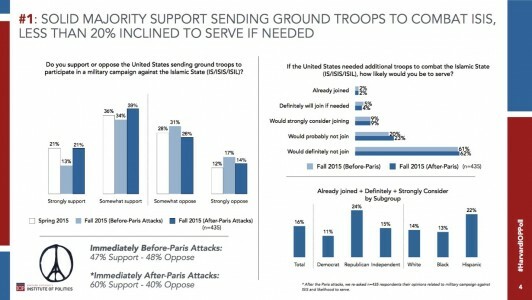 The 2015 poll conducted by Harvard’s Institute of Politics reports 60 percent of adults 18 to 29 support committing ground troops to defeat ISIS. When asked how willing were they to join the fight, 84 percent said probably or definitely not. The millennial’s governance model will need to exceed their expectations without requiring them to work too much within it. The model will need to be flexible, available when they need it and out of the way when they don’t. Laws and regulations will need to become more subjective. Sometimes right will be wrong and wrong will be right. The rights of the individual will be what is important, as long as those rights do not infringe on the rights of the larger population. From a technology aspect, apps, widgets and mobile sites will reduce the need for large buildings full of public employees. Privacy will be secondary to their expectation of immediate results. To be sure, the governance model of a millennial-ran America will be nothing like ever before. Such changes are still a few election cycles away though right? If current voter trends continue, these changes will begin happening in the next few years and millennials come of age to run for office. At such a time, the loudest applause will likely come from Gen-X. This is what they have been preparing their millennial children for their entire lives. Strong, determined, outspoken and willing to live life on their terms, millennials outgrew the confines of a Gen-X led America before it even began. Politically, America is in turmoil and each generation is playing their respective roles to perfection. Boomers are still at the helm and determined to remain so. They believe with enough hard work, they can succeed. If they just put enough hours in at the office, everything will turn out as it should. Gen Xers are disassociated from the process – though this year’s election cycle has turned this stereotype on its head. Millennials, unlike their parents, are making sure their voices are heard. They have a vision for their country. They believe this is their country and just like their first jobs, they’re not interested in waiting much longer to run it. They have strong opinions and are not concerned with what others think of those opinions. They want what they want and they’re willing to vote to get it. The governance models of the past are not going to work for them. Their model will be dynamic, fluid, collaborative and like nothing seen before. Author: Andy Plumlee is a dual MBA and MPA candidate in sustainable management at Presidio Graduate School in San Francisco, Calif. During his time in school, Andy has worked on projects for the City of Berkeley, California, as well as nonprofit and private sector organizations. He can be reached at [email protected] or connect with him through LinkedIn at https://www.linkedin.com/in/plumlee.